Hey folks and happy Monday! So we are a little over a week out from Christmas, and if you are hosting guests this time of year, then you know how important it is to “appear” to have it all together, right? Meaning making your guests feel at home, and making pretty much anything that they will need within a close arms reach and making sure you stocked on essentials, toilet paper, towels, etc. On the contrary, if you are anything like me, sometimes storage space can come at a premium. For example, my guest bathroom is pretty small. So having everything needed for my guests inside of that small space just won’t work, but finding a solution to fit in the nook outside of the bathroom was just perfect! 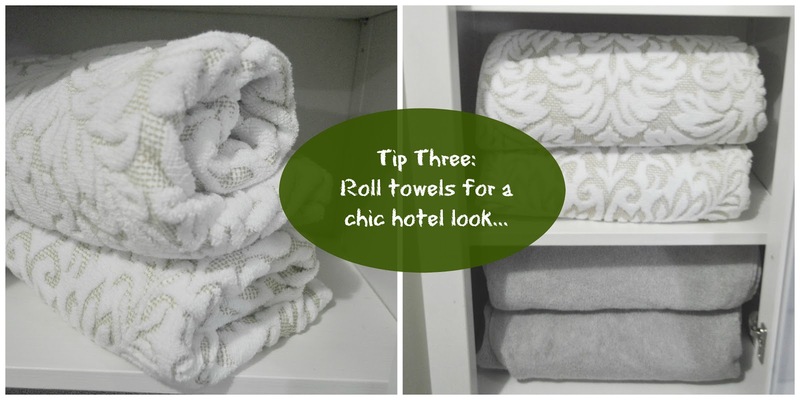 you can change the roll less often during the busy holiday season. A+! Not sure about you, but during the holidays, running to store for a toilet paper run is last on my list. After getting my Quilted Northern® Mega Rolls home, I got busy organizing and making my guest cabinet pretty. 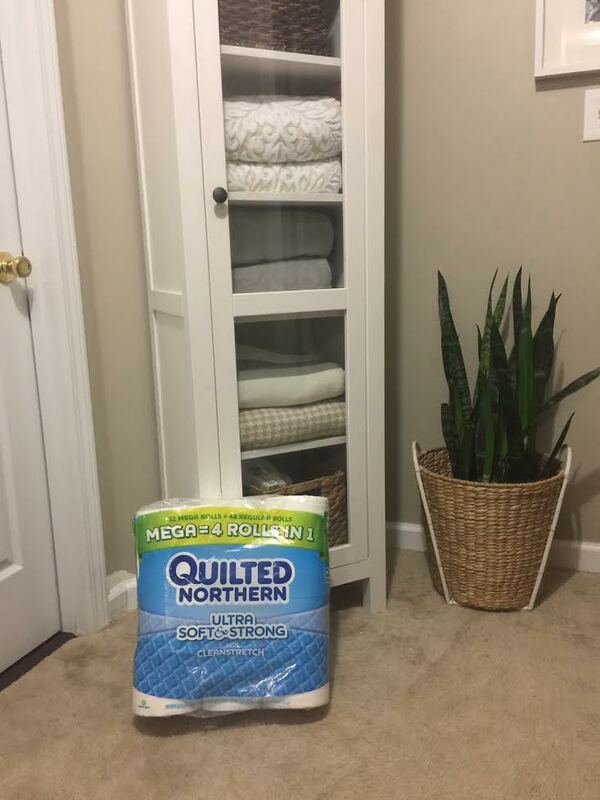 I started by arranging my Quilted Northern® Mega Rolls at the top. To be honest, I think fresh toilet paper is a nice decorative addition and doesn’t have to be hidden. It’s clean, white and adds a bit of texture. 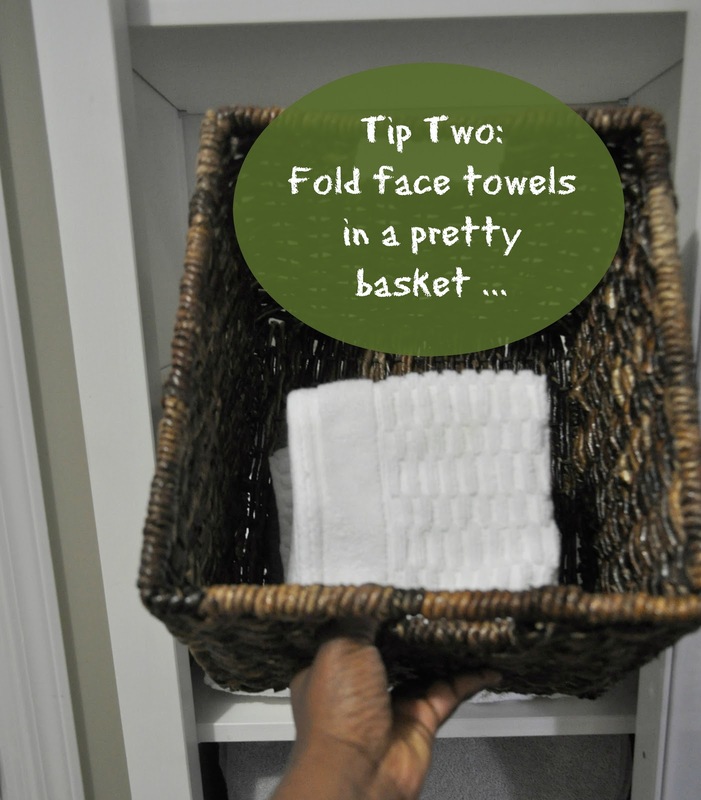 On the next row, I added a wicker basket with clean folded white face towels. 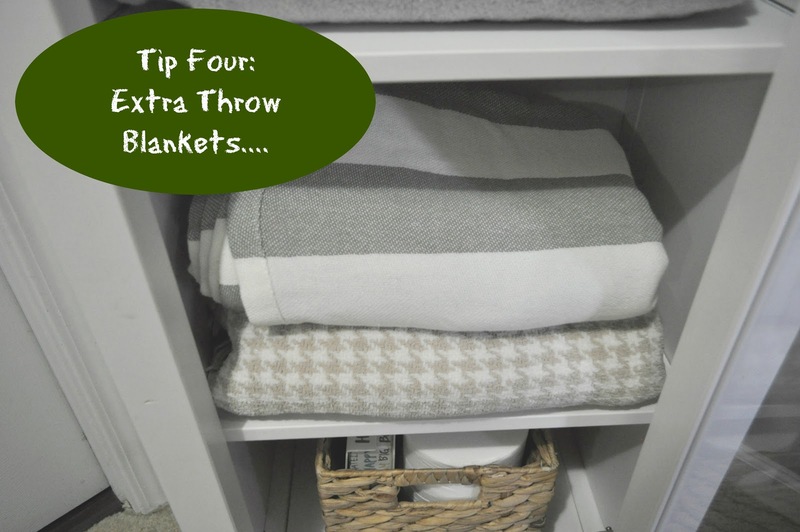 Although I place towels in the guest bedroom for guests to use in the beginning, It’s a nice addition to have extra towels available should they need more. The next couple of rows are for the extra bath towels, both patterned and decorative. I like to roll them, instead of folding them because it gives off a nice chic hotel look. Next, I added some extra throw blankets. You just never know when an extra chill might hit, so I like to have this option available. On the last row, is another wicker basket. 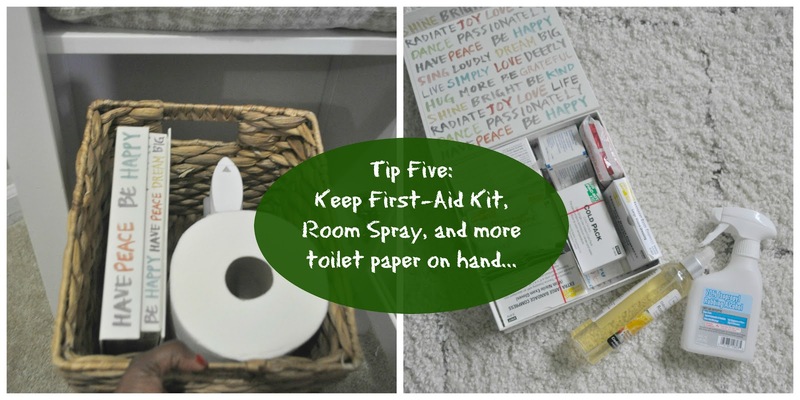 In this basket is a first-aid kit, some room neutralizing spray, and of course additional toilet paper. I opted to remove the first-aid kit from its original packaging and placed everything in this box filled with affirmations. I think it’s a nice touch. If my project inspired you, be sure to find more Quilted Northern inspiration via their social hub here. And if you love saving a coin like I do, be sure to use the Cartwheel offer to save an additional 10% off of your purchase at Target December 4th through December 31st. Oh, and don’t forget to enter the sweepstakes where you could win a Target giftcard up to $1000. What could be a better way to make the holidays even more jolly! So folks, are you guest ready? Let me know in the comments ways that you prepare your home for guests. Thanks so much Cristi! It definitely is a space saver. 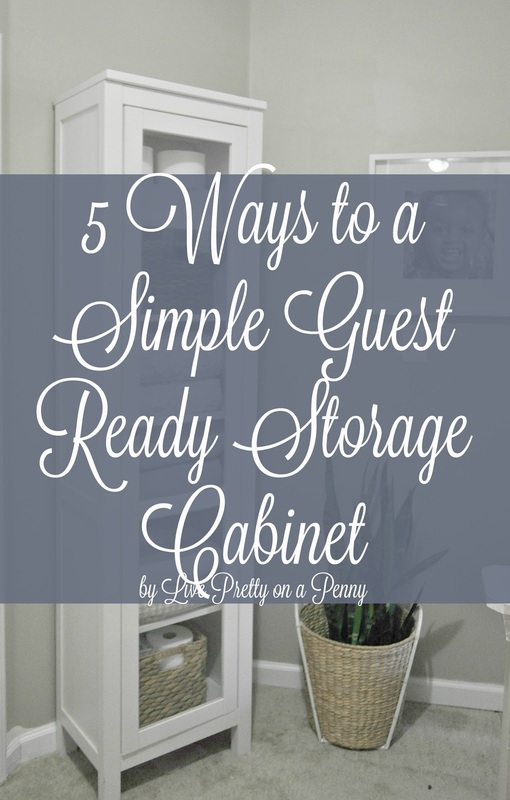 I LOVE the cabinet!It's great for small spaces and I love the clean look. Thanks Jamala! It's very convenient. 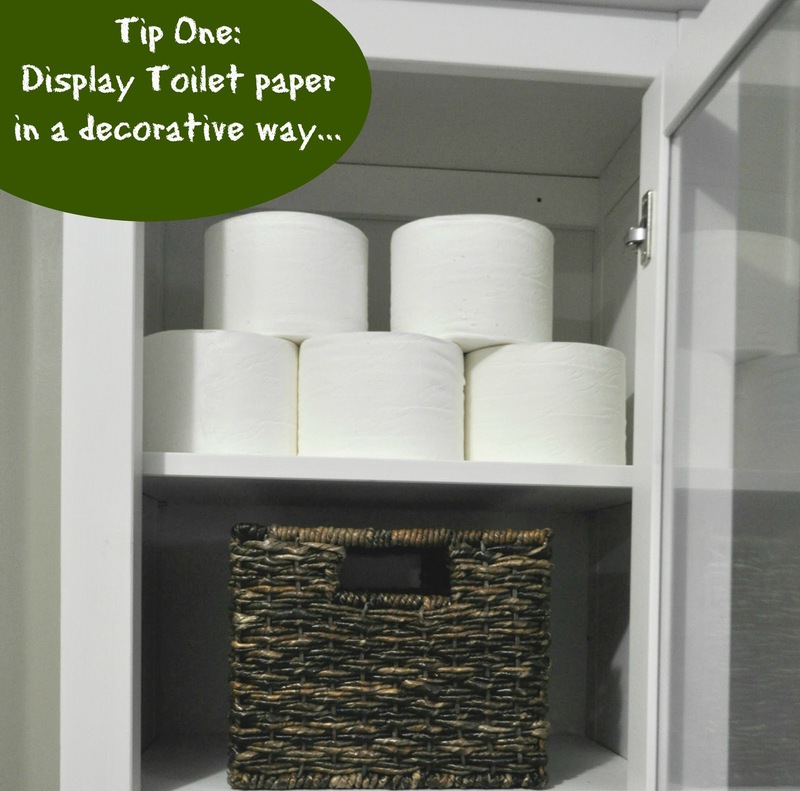 I love how you styled your cabinet, it's great for necessities, especially tissue! 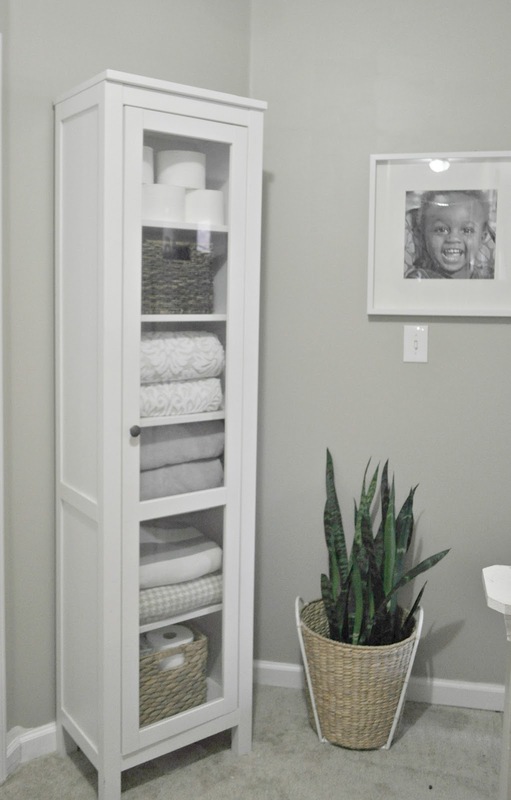 I agree storage space is hard to come by, so I love this idea of placing it outside the bathroom. Yes, its a great space saver. Thanks! 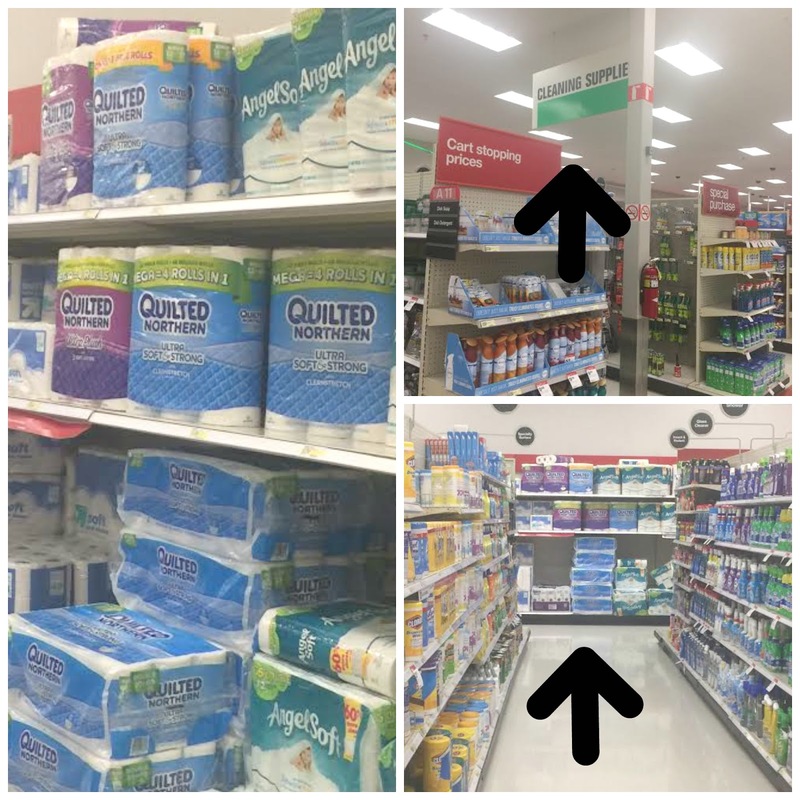 How easy for guests to find what they need. Great ideas and space saving, thanks for the tips ! Great post, Erin! I love this cabinet, it would be a nice piece for me, because it looks to be space saving, which is what I need for my small apartment. It would be the perfect solution for having all my guest essentials in one spot. Happy New Year Erin! Where did you purchase this cabinet from?